Prepositional Phrase | What is a Prepositional Phrase? Here are some more examples of prepositional phrases. 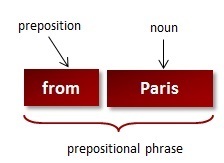 In each example, the prepositional phrase is shaded with the preposition in bold. Be aware that prepositional phrases function as adjectives or adverbs. Please read the message from Lee. The man on the radio has a boring voice. May I see one of the brown ones? Lee caught a small mackerel with utmost pride. Before the war, Lee played football for Barnstoneworth United. Lee is tired from the hike. Lee lives in that fridge. A list of factors are at play. A list of factors is at play. Read more about mistakes with prepositional phrases and verbs.